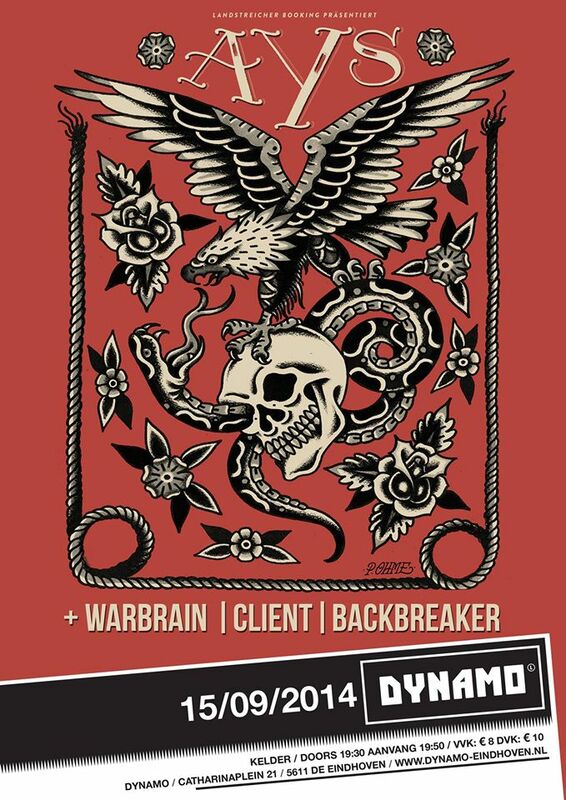 AYS is playing a show at Dynamo in Eindhoven (NL) on September 15th with Warbrain from Australia and Client from Germany. Local band Backbreaker will be opening up. We’re giving away 2×2 tickets, so you know the deal: head over to our Facebook-page, FIND the above poster, TAG yourself in it and SHARE it on your wall. The winner will be announced in the first week of September. GO! Check more info in the Facebook-event. Tags: AYS, BackBreaker, Client, Concert, Contest, Dynamo, Eindhoven, Europa, Europe, European Tour, Facebook, Poster, Show, Tickets, Tour, Warbrain, Win, Winnen. Bookmark the permalink.